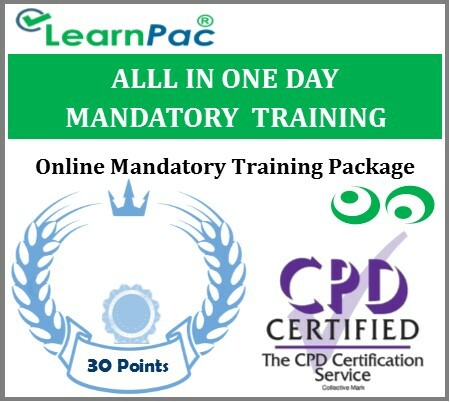 Welcome to LearnPac Systems’ all in one day online mandatory training courses package for healthcare and social care providers. This all in one day online mandatory training courses package was developed to meet the requirements of commissioning organisations, Care Quality Commission (CQC) and other regulatory and professional bodies in the UK. Whats included in this all in one day online mandatory training courses package? LearnPac Systems works with thousands of NHS and private sector providers of healthcare and social care services. This all in one day online mandatory training courses package was to meet the requirements of NHS Trusts, private hospitals, recruitment agencies, locum agencies and other health and social care providers. 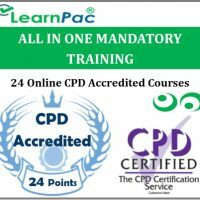 This all in one day online mandatory training courses package covers all the essential statutory and mandatory training subjects in line with Care Quality Commission (CQC) requirements. Who is this all in one day online mandatory training courses package for? 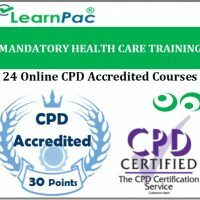 Our all in one day online statutory and mandatory training courses package is suitable for all healthcare and social care professionals, whether they work part time of full time in NHS Trusts, private hospitals and other health and social care providers. Locum and agency workers, including doctors, allied health professionals, nurses, healthcare assistants and health and social care support workers should also complete mandatory and statutory training courses in line with their job roles. For experienced healthcare and social care professionals, refresher mandatory training or annual mandatory training updates are required. New healthcare and social care workers are required to complete full induction programs that usually include the core statutory and mandatory training courses. New health and social care staff can also complete the Care Certificate, which can be combined with their induction training/statutory and mandatory training. What are the benefits of the all in one day online statutory and mandatory training courses package? Just pay one price and complete your statutory and mandatory training all in one day! Start your online training and finish in one go, or leave and pick up where you left off! Which mandatory training courses do I need to complete? The majority of NHS Trusts, private healthcare providers, nursing agencies, locum and other health and social care agencies now insist that healthcare and social care professionals working in their organisations should complete mandatory and statutory training that is aligned to the Skills for Health UK Core Skills Training Framework (CSTF). All our core health and social care statutory and mandatory training modules are aligned to the Skills for Health UK Core Skills Training Framework. How do I book for the all in one day online statutory and mandatory training courses? You can book for the all in one day online statutory and mandatory training courses online. Just click ‘Buy Now’ in the top right hand corner of this page to order your mandatory training courses online. Follow the instructions to complete the order. Once you complete your online order, you will receive a confirmation email within a few minutes. You will also receive a seperate email providing you the link to you mandatory training courses online and login details. You should then be able to immediately access your online mandatory training portal and complete you statutory and mandatory training modules. 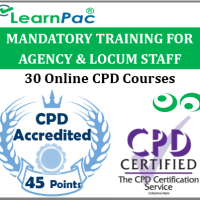 Why complete your training with LearnPac Systems? Can the all in one day online mandatory training courses be used for NMC revalidation? The Nursing and Midwifery Council (NMC) now requires all registered nurses and midwives to complete ‘revalidation’ every three years. 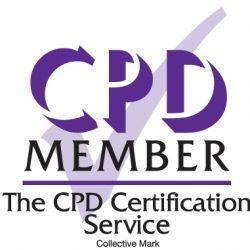 The NMC revalidation process for nurses and midwives requires registrants to provide evidence of their practice and that they have covered 40 hours of continuing professional development (CPD) over the preceding 3 year period.